In stock 234 items in stock. How much heat can this dissipate? 2w? Today I learn a valuable lesson. Buy the parts first, then order the boards. Today I learn a valuable lesson. 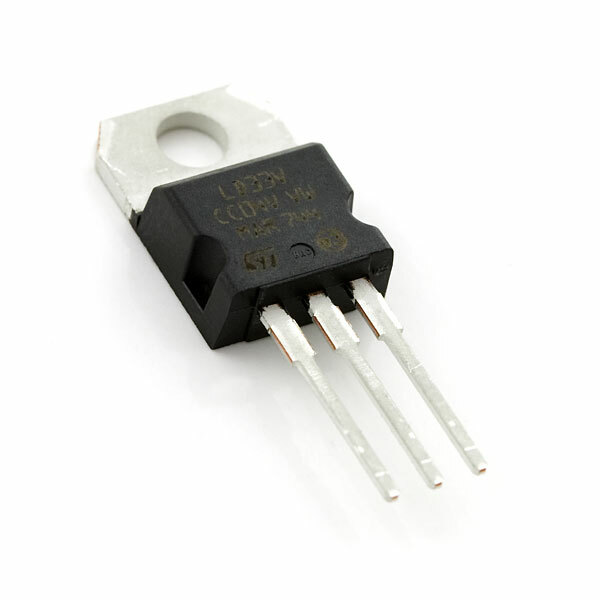 Do NOT assume all TO-220 voltage regulators have same pin-out. Check datasheet before soldering! May I ask where you found the data sheet? The one here seems to be damaged. And I too have now lost parts due to this pinout. Was getting really close to getting that xBee working too before I cooked it. The pinout on the one I got is correct as far as the datasheet is concerned and I had it working once. Then rebuilt the power supply on the breadboard from my memory of the 5v one which is totally different. 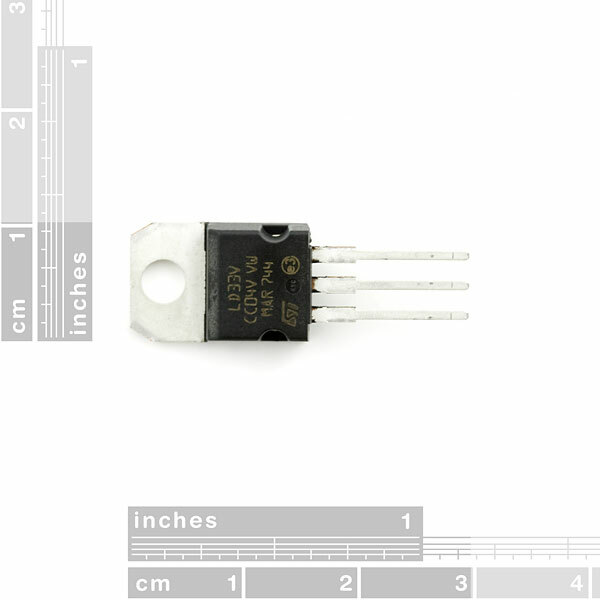 PLEASE NOTE: this pinout is not the same as the millions of other regulators youâve used. Another suggestion--sell these two ICs under different product numbers since they have different pin configurations. That way you'll know what you're getting. Kinda sneaky how these got changed around. Luckily I was only breadboarding. These pinouts are all left to right as seen in the first image above. The tabs of both types are connected to the center pins. one more. the 78xx was created in the dark ages. and has nothing at all to do with the above part. It was invented by Robert C. Dobkin and Robert J. Widlar in 1970 while they worked at National Semiconductor. 43 years ago, my hay day. the above is 2004 creation, the original engineers are dead or retired. now. RIP if latter. dont feel bad, i burned my hand on a 78xx , in 1970, wired wrong, there is no protection diode on the 78. sorry. that same protection diode above, blows up your 3v parts, with supply minus 0.7v (protects reg, but not load , sorry) boom. guys make sure you triple check the pins on this thing, i don't mean to be a troll, but this thing somehow killed my netduino mini. So make sure you put it on a bread board and test it, before you hook it up to something else... and sparkfun whats up with the laziness? just make a clear note on the product description. this really upset me. So you have one and probably tested it by now? Or at least you know which pinout is wrong? take a look at dent's comment. he has the correct pins i tihnk. still make sure you test it with a battery or something before you hook it up to your actual project or whatever. WTF? You are selling two completely different parts with DIFFERENT pinouts as the SAME NUMBER???? And this is going to help your customers how, exactly??? One of the possible parts is low-dropout and the other is not. Any way to predict which part you'll get if you order? Not sure if someone had this happen to them but when I plug in a LiPo battery charged to 4.5V it outputs 3.7V and gets really hot. And when trying a 9V battery (to see if the reason the output was 3.7 instead of 3.3V due to a lower input voltage) I ended up with 7.24V and it got REALLY hot really quickly (to no surprise). Anyone have similar issues? A dropout voltage of 1V is nothing to brag about. I've seen LDOs with dropout voltages as low as 50mV. Anyone know if this chip is good for converting a 0-5V input into a 0-3V output? Would this work for powering 3.3V devices from one of the 3.7V LiPo batteries you sell? Reading the datasheet I noticed the dropout voltage is 1 volt with a 100mA load, which is very close to what I think my circuit will draw. Because of this the minimum voltage I can use as input is 4.3 volts, a.k.a. I'm f*cked. And the reason why I'll use a LiPo is that I need the device to be as small and thin as possible. I'm planning the layout of a project including this component on perfboard, so would this normally be standing on a finished board or should I lay it down? You can use it either way. Just keep in mind if you're going to bend the legs to lay it flat on the board, you need to be careful not to break the legs off. I personally adjust these for height clearance after I've soldered them into prototyping areas in my own projects. Also, keep in mind having it stand up will allow for it to get a bit more air flow-these do tend to run warm. the TO-220 CASE moniker is lacking. the TO-220 is a base family of parts and has many version. and is a JEDEC standard , since even my younger days in 1970s. the codes vary MAKER TOO. never assume one co. uses same package codes. ever. and WIN. this applies to transistors in spades. too. look up TO92 and see 3 forms. so when buying parts, get the data sheet and see what suffix your brand uses, for the TO-220. case. and yes, spark fun fogot to say which case it is, I suspect they forgot or just dont know cases too well. now go to mouser, a real distributor. and see how the sell parts. at 55 cents each qty 1. the photo shows STI maker. and they only make 1 , 220 type. the STI data sheet shows. facing plastic 1 gnd, 2 out, 3 in , left to right leads towards you. is yours STI? you never said. Could someone please fix the Eagle library pins for this 3.3V regulator?!? Next, connect your +9V to VIN, and your battery ground to GND. You'll probably need at least one resistor between the 3.3V output and your LEDs. There are a bunch of good online calculators for this, such as this one for single LEDs, and this one for multiple LEDs. 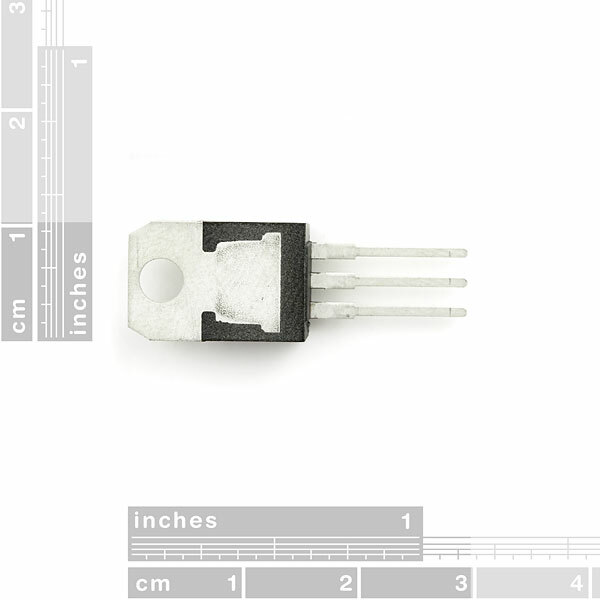 They will ask for the LEDs forward voltage and current, you can find this in the datasheet for your LEDs. Have fun! Is 15v the absolute maximum Voltage? Can't seem to find absolute max in the datasheet. pg 3 of the DS, table 2 - "Table 2: Absolute Maximum Ratings" - Vin=15V....? I'm really new to this so I'm sorry if this is a newbish question, but do I basically just plug one pin into my 6V input, one pin into ground and the last will put out a nice 3.3V? Thanks! For many applications, this one is unnecessaraly big. How about storing something like MCP1702-33? Which is the correct pinout? Suggestion; sell surface mount versions of these, I have a hard time finding them in other stores. No, the 3.3 and 5 volts ones. We'll definitely look into it! Just incase anyone else was confused by the doc sheet on this. it is ground, V out, V in. This turned my 5v into 3.3v! As expected, of course. Here is an easy to use constant 3.3 volts It's useful to power a newer CPU board and a herd of sensors. Except for a pin swap, it is as easy to use as the 7805. Recommended.